Sqwincher 1 Gallon Powder Pack Concentrate is great for when only one gallon of electrolyte drink is needed at a time. Sqwincher 1 Gallon Powder Packs come in a case of 80 packets and contain a fine powder that mixes easily with water. Sqwincher is a scientifically formulated electrolyte replacement drink designed to restore important mineral and fluids lost through dehydration, physical exertion and heat stress. 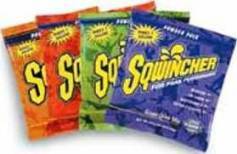 Sqwincher 1 Gallon Powder Pack Packets come in a variety of flavors including Lemonade, Orange, Fruit Punch, Lemon-Lime, Grape, Cherry, Tropical Cooler, Tea, Mixed Berry and Cool Citrus. There is also an assorted flavor cases available with a mix of Orange, Grape, Lemon Lime and Fruit Punch. When a larger amount is needed, Please look oat our 2-1/2 Gallon Powder Packs and 5 Gallon Powder Packs.